WHAT: Designs game-related hardware for interacting with touchscreen devices and licenses those designs to manufacturers. Joystickers continues to make three of its own devices including arcade-style buttons that suction-cup to your device and a paintbrush for tablets. WHY: There's more money in licensing hardware designs than manufacturing and selling hardware. People with touchscreen devices are willing to spend money on things that make those devices more fun. A range of products could work with touchscreen devices -- even a jump rope, which Joystickers debuted at Excelerate Labs demo day. WHEN/WHERE: July 2010 / Chicago. BACKSTORY: "One day, Anthony was playing a first person shooter game on his iPad and in the heat of battle, he lost the position of his finger and he got shot in the face," Russ wrote on the company blog. "That’s how it all began, back in May of 2010." The founders tried raising money on Kickstarter earlier this year but canceled their project after getting to $7K of their $25K goal so they could focus on launching one product at a time. After joining Excelerate Labs the founders pivoted from hardware design and manufacturing to much lower cost electronic design. "As we participated in Excelerate, we realized there is a lot of things you can do to interact with a touchscreen device, and do we really want to be in the business of doing all of those things?" Anthony says. BUSINESS MODEL: Licensing designs to manufacturers. 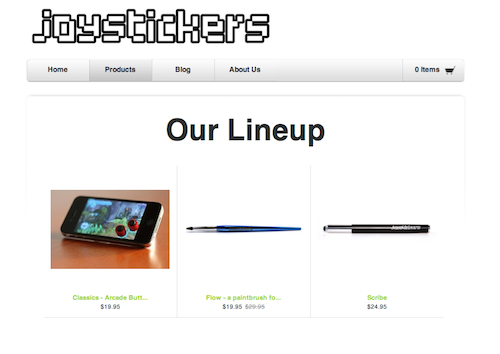 Joystickers continues to sell the hardware it designed and manufactured: arcade-style buttons cost $19.95, the paintbrush is $19.95 and the pen, $24.95. ON HARDWARE MANUFACTURING: "Our experience has been interesting," Anthony says. "We started by cold-calling manufacturers to see if they could do what we need to do. We got shot down a lot and eventually, once we posted our products on Kickstarter, they started coming to us." ON EXCELERATE: "To say it's incredible is not giving it enough credit," Anthony says. "I don't know if we would have come to this realization and new business model as quickly as we would have if at all if it wasn't for the mentorship. It's incredibly stressful because you are bombarded with a million different ideas every single day and you are expected to make progress throughout the summer as well but it was invaluable." GOAL: "We see where the future of gaming is going and our ability to iterate and sort of see the writing on the wall. We are going to create the best experiences for mobile gaming," says Anthony. The "Classics" is Joystickers' first product. These nimble little buttons attach tightly to your device via suction cup but do not leave marks on the screen when you remove them. "Flow" is a soft tipped paintbrush designed to be used with your iPad or Android tablet to give the user full control on their tablet canvas. The "Scribe" is a pen for touchscreen phones and tablets designed to deliver the same feel to the user as writing on paper.